In the beginning, as parents with a newly diagnosed child, we were in absolute shock. How is this possible? Is this really happening to us? What does this mean for our precious Max? What is our next step? In one phone call, our world was turned upside down and we didn’t know where to begin. On this journey, we have had many people help us in tremendous ways from setting up and paying for Bone Marrow drives to find a match for Max, to taking care of our kids, preparing meals, fundraising and so much more… our Earth Angels. One such Earth Angel was our next door neighbor, Mary Jane Schwartz. She has definitely earned her wings. Immediately she stepped up by searching on-line for the latest research about AML, the best treatment protocols, the top medical facilities for treating this leukemia as well as providing information on support services. She provided daily updates to our friends and family about Max’s progress from the very beginning until the very end. The list goes on and on and we will be forever grateful to her. We know that many parents facing a recent diagnosis may not be as fortunate to have a friend or family member like this. That’s why we created this website. It is our hope that the Blue Butterfly Campaign will help you navigate through this journey pointing you in the right direction and answering some of your questions. Max was an amazing, gentle boy with an old soul and dry sense of humor. He loved pepperoni pizza, chocolate, basketball, baseball, his friends and his family. We called him our brave warrior, and that he was. The first seven years of his life were full of laughter, light heartedness, joyful play, creativity and sports. 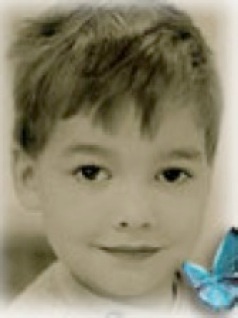 On July 13, 2000, Max was diagnosed with Acute Myeloid Leukemia (AML) with a chromosomal abnormality (Monosomy 7). He was given a 10% chance of survival. After 7 months of fighting hard, enduring three rounds of chemotherapy, radiation and a cord blood transplant, Max lost his battle on February 15, 2001. He fought with dignity and courage beyond his years, and he will always be our biggest hero.